Here we have another monster double-sider which not many people might be are aware of. Carmelitais best known for her Northern Soul bomp Rosebud, but what you find on this release is completely different. 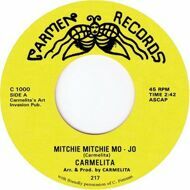 Mitchie Mitchie Mo-Jocan be filed under latin-funk while the flip side is an easy grooving latin-soul number. This one's superrare and supergood too, well worth to pick up this official re-release.